Can a Super PAC Convince Ayotte and Hassan to Disavow Super PACs? Gov. 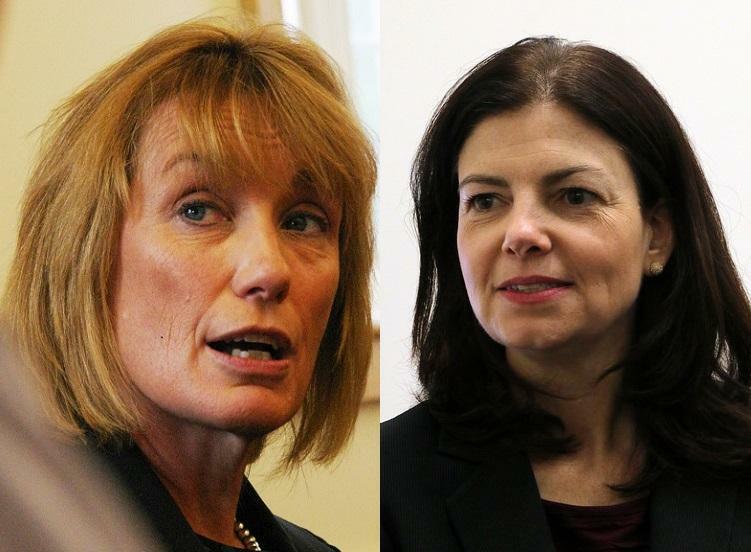 Maggie Hassan (left) and Sen. Kelly Ayotte have sparred over how to regulate outside spending on their race this year. Here's a twist in an election year in which the role of money is a dominant theme: A Super PAC created to blunt the influence of Super PACs in key political races is jumping into the Senate contest between Sen. Kelly Ayotte and Gov. Maggie Hassan. CounterPAC, whose founder and primary financial backer is Bay Area gaming developer Jim Greer, plans to run a full-page ad in Thursday’s Union Leader, urging the two candidates to agree to a cap on independent expenditures. “New Hampshire’s Next Senator Should Work for Voters, Not Special Interests,” says the CounterPAC ad, which asks voters to call the candidates and tell them to reach an agreement by March 1. Ayotte and Hassan have already proposed their own variations on a so-called people’s pledge to discourage 3rd party spending on radio, television and digital advertising. Ayotte opened the bidding with a pledge modeled on the one used in the 2012 Massachusetts Senate race between Scott Brown and Elizabeth Warren, which effectively eliminated millions of dollars in outside spending. Hassan countered by proposing that the candidates also limit their campaigns to spending no more than $15 million each. The two sides failed to reach an agreement and have accused each other of not taking the issue seriously. 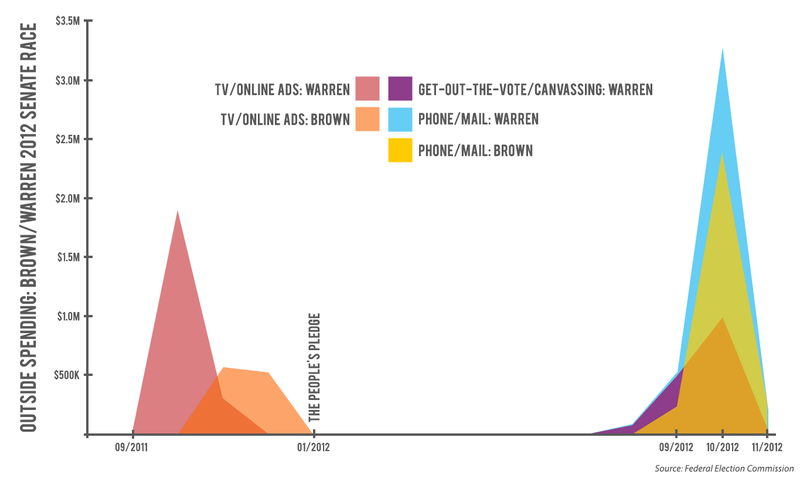 One possible sticking point: To date, Ayotte has benefited far more from outside group involvement. Three groups, including the U.S. Chamber of Commerce, have spent $2 million to support the incumbent, while $600,000 has been spent on the governor's behalf. Counter PAC's proposal acknowledges that disparity by asking the candidates to negotiate their own cap, then agree that any outside spending above that amount would trigger a charitable donation from the campaign coffers of the candidate that benefits. "We think there is an opportunity to negotiate terms that would keep the vast majority of outside spending out of the race without putting either side at a disadvantage," says Jay Costa, Counter PAC's executive director. "What we are doing is calling on them to enter into good-faith negotiations and keep the conversation going." CounterPAC isn't the only organization urging the candidates to disavow outside spending. Open Democracy, a New Hampshire non-profit that advocates for changes in the nation's campaign-finance system, has been working with both campaigns to reach an agreement on a pledge. Open Democracy's Executive Director Dan Weeks says he is hopeful. “I think this is salvageable, and I think both sides deserve commendation for putting something forward and being willing to negotiate further," he said. "The fact that a group like CounterPAC is coming in to try and make this an issue is evidence of how much voters care and how important the issue is nationally." Whether it's enough for the two candidates to come to terms remains to be seen. But there’s little doubt that, absent the pledge, Super PACs and other outside group will continue to pour money into the contest, which could determine which party controls Congress. Thanks to $30 million in independent expenditures in 2014, the Senate race between Brown and Jeanne Shaheen was the most expensive election in New Hampshire history. One of the more closely-watched Senate contests of 2016 won’t be bound by a so-called people’s pledge after all. Sen. Kelly Ayotte, the Republican incumbent, and Democratic Gov. Maggie Hassan have failed to reach an agreement to limit the influence of outside political groups in the race.